Battlefield Hardline is closing in on its first birthday and the DLC keeps on coming. Getaway is the third of four expansion packs for the dubious law enforcement sim, arriving January 12 if you bought Battlefield Premium (or have the sudden irresistible urge to buy it now) and January 26 if you want to exchange a single sum for a single xpac like pa used to do. Getaway brings an amusingly titled new mode, Capture the Bag, which EA describes as "similar to capture the flag", and I'll leave it down to you to divine the difference. 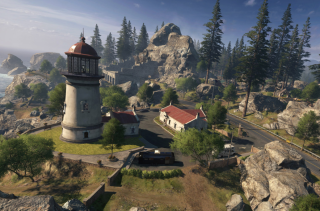 The four new maps are Pacific Highway, which features coastal California; Train Dodge, cut by an active railway which the police feel no need to close; Double Cross on the US-Mexico border; and Diversion, set inside flood defences and devoid of driving. There's the usual padding, of course, including a fireman's axe which will one-hit kill anyone blind enough not to see you running at them with a fireman's axe.